Sublimated baseball jerseys are the futuristic team uniform choice, featuring true all-over printing. Start with one of our patterns or design your own from scratch for complete creativity. The sublimation printing process uses solid dye block printheads that heat up and infuse colours directly into the fabric, leaving a clean, vibrant, layerless finish. 1. 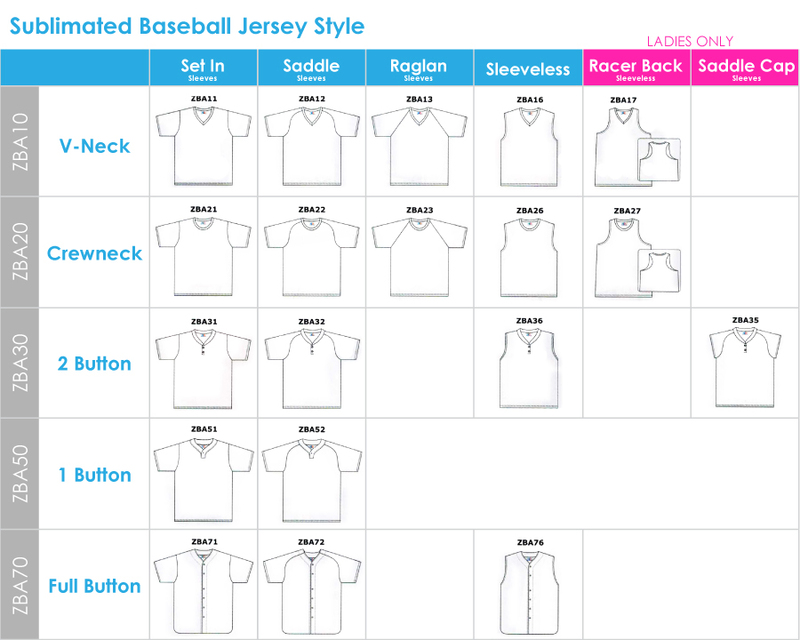 Find the jersey style you want: Full Button, 2 Button, 1 Button, Crewneck or V-Neck. 2. See a pattern you like? Great! If not, we've got plenty more, just ask! -OR- We can create a 100% custom whole-jersey design from your art. 3. Send us your team logo and roster with player numbers and one of our experienced customer service representatives will get back to you with a quote. 4. We'll send you a proof and upon your approval, we print your jerseys. Sublimated numbers for your team are included, but sublimated names for each jersey are $10 extra.